On Good Friday in 1995, my mom underwent a bone marrow transplant to fight chronic mylogeneous leukemia. 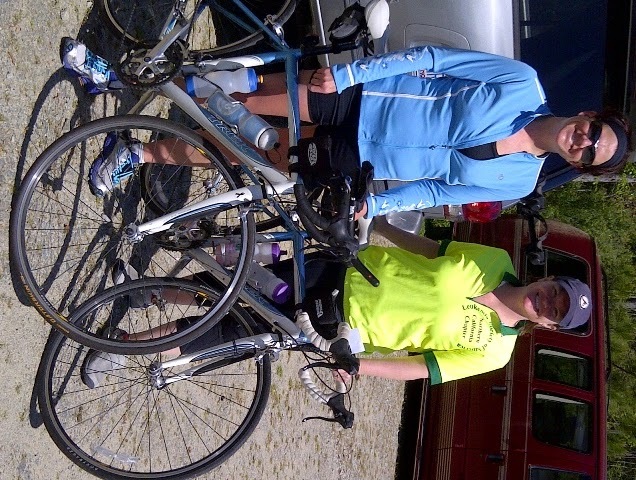 On June 3, 2012, I am doing a 100-mile bike ride with my sister Anna Formy-Duval Jones for Team in Training in her memory. We have signed up to do the Fletcher Flyer - a full century ride in the mountains! My sister, Anna, is the instigator to this latest madness. She signed up with Team in Training - the fundraising branch of the Leukemia and Lymphoma Society. She is raising money to help find cures and better treatments for leukemia, lymphoma, Hodgkin’s disease and myeloma. I thought it would be fun to do my first century ride with her - and for a cause we both believe in! This weekend, we rode together with her TNT team. 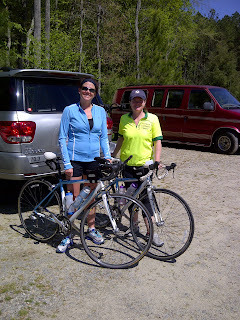 I drove up to Raleigh on Friday night and on Saturday morning we joined her team in Apex for a 32-miler. The day was cold (41 degrees) but bright and sunny. Everyone was welcoming and encouraging in the pre-race pep talk. Plus, I had a fine time getting to know a few of the other riders as we rolled through several counties. A couple of them are training for the Fletcher ride and everyone else was training for America's Most Beautiful Ride in Lake Tahoe. Our ride was a challenge and a thrill. The scenery was incredible (I admit it was nice not being in Pender County). Barns, strawberry fields, views of Jordan Lake and grand country estates were breathtaking. I loved learning how to ride in a double eschelon peloton! There were at least 15 riders and we rode in a double pace line for the first several miles - something I've never done before. Plus, I learned how to handle rolling hills. BUT, we did a two mile climb - nearly 200-foot ascent - and that was TOUGH. I used every single gear [yes, I reverted to my granny gear] and my heart rate climbed into Zone 4. Check Out that Graph! That's a Cat 5 Climb! I will say that the ride down was worth the pain. We reached the turn-around at the top of Jack Bennett Road and I tucked into my drops, pedaled a few times and let gravity do the rest. I reached 30 miles per hour!! It was so exciting and FAST! I discovered that I'm pretty good on short hills - my spin classes are paying off! I learned that I'm even better on DOWN hills. One of my favorite parts of the day was the mission moment before the ride. A young woman - a daughter like us - shared the story of her mom's fight against A.L.L. She revealed that her mom lost her battle around Easter a few years ago and rides in memory of her and the struggle she endured. I tried not to cry during her story (I didn't dare look at Anna!) 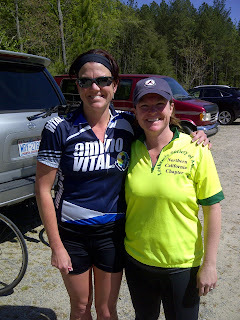 but, I connected with her story and thought of our moms several times during the ride. Mama was diagnosed in 1993 and endured chemo, radiation and finally, a bone marrow transplant in 1995. Mama lost her battle right after Thanksgiving of that same year. She would be 65 this May. If our efforts help fund research for an alternate drug therapy, or provide comfort through a family support group or save one daughter from losing her mother too early.....then one hundred miles (uphill, both ways) will be worth every minute. If you'd like to contribute to our effort, please CLICK HERE to head to Anna's fundraising page.